Zeeshan Manzoor cracked 79 not out for Ketton at Foxton. One huge win, two massive innings and one superb bowling performance dominated Cambs League action yesterday (June 24). Ketton took a big step towards their first Division One title by beating main rivals Foxton by five wickets in a battle between the top two, while Wisbech Town legend Gary Freear and Ufford Park’s Ross Keymer were plundering massive tons and emerging Castor bowler Stuart Dockerill was bagging a hat-trick in a five-wicket spell. Ross Keymer whacked 167 not out for Ufford Park at Burwell seconds. Ketton are 40 points clear at the top after winning the battle of two unbeaten teams at the home of the reigning champions. 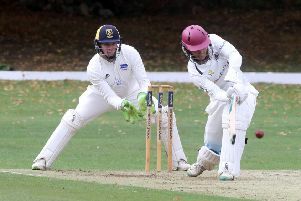 Tight bowling led by Bengali star Iresh Saxena (3-18) restricted Foxton to 184 and Zeeshan Manzoor, in a restrained innings by his standards, then struck an unbeaten 79 from 101 balls to steer Ketton home. Manzoor found a strong batting ally in Matt Milner who made just 17 in a key unbroken sixth wicket stand of 69. Freear’s remarkable season continued with an innings of 187 at Histon. That’s five tons in 10 Division One outings for the hero of Harecroft Road. He’s now struck 855 runs at an average of over 100. Gary Freear made 187 for Wisbech at Histon. Freear clouted seven sixes and 24 fours, but his brilliant knock was still tinged with sadness. For the second time this season he fell just short of his career best 195 when he was caught on the boundary with seven balls of the innings remaining. Wisbech’s 337-5 proved 86 runs too many for the home side as Brodie Ellis picked up five wickets. Wisbech are third and Ramsey have moved into second after their expected six-wicket win over bottom club St Ives. Foxton have dropped to fourth. Nassington are moving up nicely. They made it three wins on the spin with a crushing 152-run win over Godmanchester at Fotheringay Road. Conor Craig (84), Alex Laud (73) and James Pope (59) all posted half centuries in Nassington’s 321-6. But March are just a point outside the relegation zone after a 44-run reverse at home to Eaton Socon. March slumped to 24-5 in reply to Socon’s 259, but sprited knocks from Tyler Phillips (65) and Spencer Saberton (50no) at least earned them respectability from a finishing score of 215 all out. For the second successive Saturday, Castor rushed to an early finish in Division Two. They were an hour later yesterday when finishing off an eight-wicket win over Huntingdon at 3.30pm. Dockerill’s 5-36 stint included four wickets in one over for the second game in a row. Huntingon had moved serenely to 32-0 before losing all 10 wickets for a further 40. Reece Smith (3-8) also joined in the fun for the team now just two points off the promotion places. Meanwhile Keymer was wallopping 167 not out at Burwell seconds to help Ufford into fourth place, just four points behind Castor. Keymer clubbed four sixes in his third century of the campaign as Ufford raced to 379-5. Burwell finished 121 runs adrift. Foxton 184 (D. Fagan 53, I. Saxena 3-18, M. Thomas 2-29, S. Mahmood 2-36). Ketton 185-5 (Z. Manzoor 79no, A. Rodgers 21, P. Rowe 20). Wisbech 337-7 (G. Freear 187, S. Akbutt 32, J. Bowers 31, D. Haynes 26, J. Gollands 26). Histon 251 (J. Mynell 88, B. Ellis 5-34, G. Freear 3-46). Eaton Socon 259 (J. Carpenter 106, A. Wright 3-38, J. Harradine 2-45, S. Clarke 2-48). March 215 (T. Phillips 65, S. Saberton 50no, L. Welcher 30, J. Watling 4-53). Nassington 321-6 (C. Craig 84, A. Laud 73, J. Pope 59, D. Robinson 31, M. Shifran 24). Godmanchester 169 (M. Shifran 3-27, D. Bandaranaike 2-22, A. Morris 2-23, C. Craig 2-48). Ufford 379-5 (R. Keymer 169no, D. Harrington 42, S. Dahiya 41, J. Harrington 30no, J. Corder 27). Burwell 258 (A. Knight 80, E. Fletcher 55, J. Corder 2-27, W. Javed 2-40, W. Dallas 2-41). Huntingdon 78 (S. Dockerill 5-36, R. Smith 3-8). Castor 79-2 (J. Higgins 38no).